© Joseph Dougherty. All rights reserved. 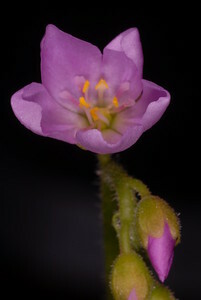 Flower of Drosera filiormis, the Thread-leaved sundew. © Joseph Dougherty. All rights reserved. 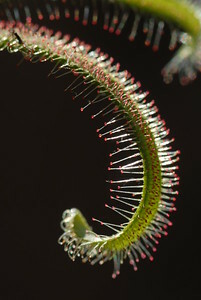 Drosera filiformis, commonly known as the Thread-leaved sundew, is a small, insectivorous, rosette forming species of perennial herb. © Joseph Dougherty. All rights reserved. 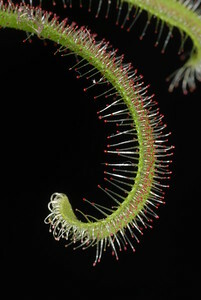 Drosera filiormis, the Thread-leaved sundew. © Joseph Dougherty. All rights reserved. 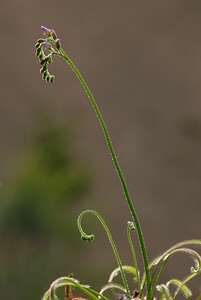 Drosera filiormis, the Thread-leaved sundew. 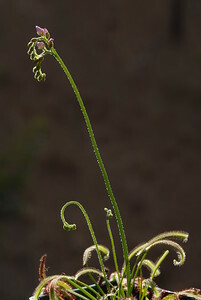 It is unusual within its genus in that the long, erect, filiform (thread-like) leaves of this plant unroll in spirals - an arrangement similar to the circinate vernation seen in ferns. © Joseph Dougherty. All rights reserved. 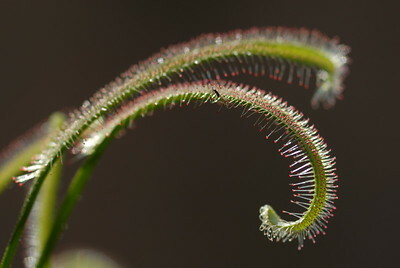 Drosera filiormis, the Thread-leaved sundew. Sundews are characterised by the glandular tentacles, topped with sticky secretions, that cover their laminae. The trapping and digestion mechanism usually employs two types of glands: stalked glands that secrete sweet mucilage to attract and ensnare insects and enzymes to digest them, and sessile glands that absorb the resulting nutrient soup. Small prey, mainly consisting of insects, are attracted by the sweet secretions of the peduncular glands. Upon touching these, the prey become entrapped by sticky mucilage which prevents their progress or escape. Eventually, the prey either succumb to death through exhaustion or through asphyxiation as the mucilage envelops them and clogs their spiracles. Death usually occurs within one quarter of an hour. 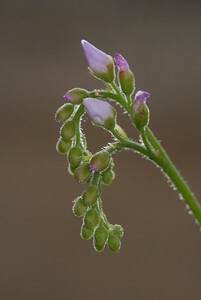 The plant meanwhile secretes esterase, peroxidase, phosphatase and protease enzymes. These enzymes both dissolve the insect and free the contained nutrients. The nutrient soup is then absorbed through the leaf surface and can then be used to help fuel plant growth. © Joseph Dougherty. All rights reserved. 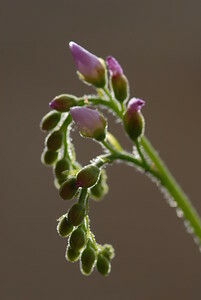 Flower stalk of Drosera filiormis, the Thread-leaved sundew. © Joseph Dougherty. All rights reserved. 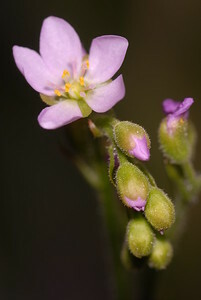 Flower of Drosera filiormis, the Thread-leaved sundew. 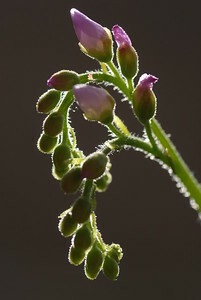 D. filiformis occurs naturally in both Canada and the United States; its natural range extends down the eastern seaboard of North America from south western Nova Scotia in the north down through New England to Florida and Louisiana in the south. © Joseph Dougherty. All rights reserved. 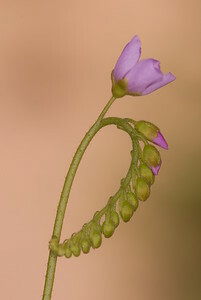 Flower of Drosera filiormis, the Thread-leaved sundew. 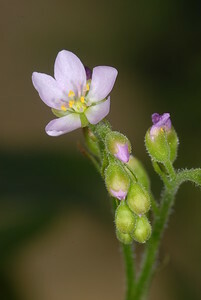 Uses as a medicinal plant: Several medicinally active compounds are found in sundews, including flavonoids (kaempferol, myricetin, quercetin and hyperoside), quinones (plumbagin, hydroplumbagin glucoside and rossoliside (7 – methyl – hydrojuglone – 4 – glucoside), and other constituents such as carotenoids, plant acids (e.g. butyric acid, citric acid, formic acid, gallic acid, malic acid, propionic acid), resin, tannins and ascorbic acid (vitamin C). Sundews were used as medicinal herbs as early as the 12th century, when an Italian doctor from the School of Salerno by the name of Matthaeus Platearius described the plant as an herbal remedy for coughs under the name "herba sole". It has been used commonly in cough preparations in Germany and elsewhere in Europe. 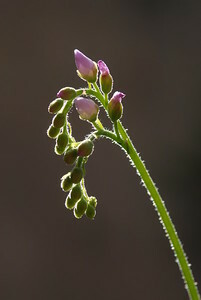 Sundew tea was especially recommended by herbalists for dry coughs, bronchitis, whooping cough, asthma and "bronchial cramps". 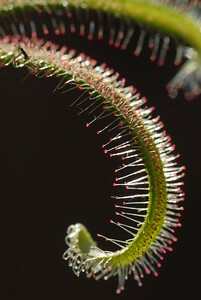 A modern study has shown that Drosera does exhibit antitussive properties. 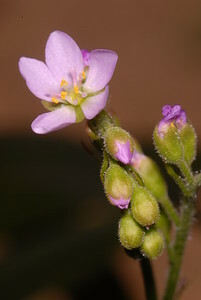 Culbreth's 1927 Materia Medica listed D. rotundifolia, D. anglica and D.linearis as being used as stimulants and expectorants, and "of doubtful efficacy" for treating bronchitis, whooping cough, and tuberculosis. Sundews have also been used as an aphrodisiac and to strengthen the heart, as well as to treat sunburn, toothache, and prevent freckles. They are still used today in some 200-300 registered medications, usually in combination with other active ingredients. Today Drosera is usually used to treat ailments such as asthma, coughs, lung infections, and stomach ulcers. Medicinal preparations are primarily made using the roots, flowers, and fruit-like capsules. 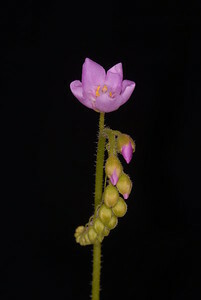 Since all native sundews species are protected in many parts of Europe and North America, extracts are usually prepared using cultivated fast-growing sundews (specifically D. rotundifolia, D. intermedia, D. anglica, D. ramentacea and D. madagascariensis) or from plants collected and imported from Madagascar, Spain, France, Finland and the Baltics. © Joseph Dougherty. All rights reserved. 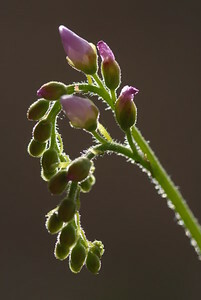 Flower of Drosera filiormis, the Thread-leaved sundew. 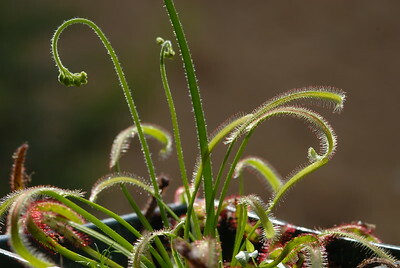 Sundews generally grow in seasonally moist or more rarely constantly wet habitats with acidic soils and high levels of sunlight. 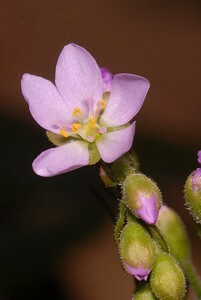 Common habitats include bogs, fens, swamps, marshes, the tepuis of Venezuela, the wallums of coastal Australia, the Fynbos of South Africa, and moist streambanks. Many species grow in association with sphagnum moss, which absorbs much of the soil's nutrient supply and also acidifies the soil, making nutrients less available to plant life. This allows sundews, which don't rely on soil-bound nutrients, to flourish where more dominating vegetation would usually outcompete them.